Preston Brooks meant to duel Anson Burlingame. Burlingame first backed down, then changed his mind after the newspapers pushed him to stand and fight. As the venue for that, Burlingame chose the Canadian side of Niagara Falls. That meant Brooks would have to travel through the North, subject to arrest and attack by mobs. Brooks declined to hazard them. As a man who knew something about indignation-born violence, he could see it coming. Burlingame then teased Brooks about not naming an alternative, then ducked out of Washington before Brooks could actually do that. Brooks’ second spent the next days searching for Burlingame, then delivered a note to his second, Lewis Campbell. You say that Mr. Burlingame was willing to meet Col. Brooks at any other place than Canada to adjust this difference. You did not tell me so although I told you that Canada was inconvenient. On the contrary, you left me under the impression that Mr. Burlingame would not meet Col. Brooks at any other place than Canada. I so informed Col. Brooks and advised him to give the matter no further notice. Inasmuch, however, as you now say that Mr. Burlingame was willing ot meet Col. Brooks at any other place, I am authorized and requested by Col. Brooks to say that he expects Mr. Burlingame to designate some other place that is convenient and acceptable to both parties, and awaits his answer to this suggestion. Brooks also told him to name any location within ten miles of Washington, or take the suggestion of anywhere within a hundred. A hundred miles, Campbell’s historian nephew noted, would have let Burlingame name a location within Pennsylvania. Brooks and Burlingame could have dueled at Gettysburg. Getting no answer to his letter of July 30th, Brooks’ second then wrote again on August 1 to escalate matters. He threatened that if he heard nothing before the coming Tuesday, the fifth, he would “make an expose of the matter.” In other words, he would publicize the fact that Burlingame had engaged in hiding from a duel he said he would fight. I know no act of Mr. B. from an exposure of which he or his friends would shrink, and am therefore at a loss to understand your threat to make “an expose” if he does not return. If, however, you have reference to your letter and my reply of yesterday, or to any act of mine, I beg to assure you that you need not delay your “expose” until Tuesday morning. I hope and pray that you are not in trouble. You must not let the rascals get out of their trouble by involving either you or myself. It will disgrace us forever if we have anything more to do with the vile set. Burlingame also noted with satisfaction that the challenge couldn’t go any further without his and Campbell’s participation. Historian Campbell attributes all this to Burlingame’s cowardice. If Burlingame acted in self-interest, including possibly leaving Congressman Campbell in a lurch, then he also acted with political cunning. By answering Brooks’ challenge, he vindicated himself to the newspapers. By naming Canada as the location, he put Brooks on the defensive. Then ducking out let him have the best of both worlds in the eyes of the public: no duel to shame him or cost his life and the widespread perception that Brooks refused to fight him, rather than the other way around. Anson Burlingame and Preston Brooks came to the edge of a duel, then backed down. Burlingame offered an apology, Brooks accepted, and both men went about their lives. Shortly thereafter, Burlingame’s apology hit the New England papers and they turned on him. Burlingame promptly changed course, publishing a retraction of his apology in the National Intelligencer. 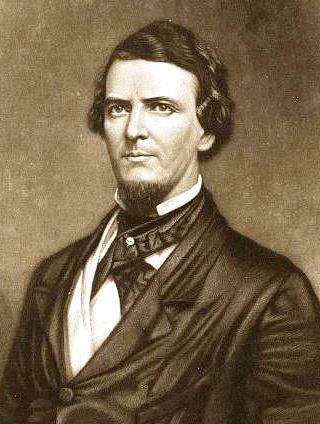 Since Burlingame determined to stand by his words on the House floor and withdrew his explanation that he condemned the caning, not Brooks personally, Brooks sent him a note on the day of publication, July 21, 1856. Will you do me the kindness to indicate some place outside of this District where it will be convenient to you to negotiate in reference to the difference between us. I could not reach Canada without running the gauntlet of mobs and assassins, prisons and penitentiaries, bailiffs and constables. … I might as well have been asked to fight on Boston Common. To waste of power a pound or so. They might take my life on the way, you know. The mockery can’t have delighted Brooks, but the paper had him dead to rights. Burlingame then appeared in the House once more, on July 28, and suggested that if Brooks didn’t have the courage to go to Canada, which Burlingame considered neutral ground, Brooks could name another place. Then he promptly left Washington. Only Lewis Campbell knew where he went. Brooks’ second spent the next days looking for Burlingame to deliver a counter-proposal as asked. Anson Burlingame castigated Preston Brooks for caning Charles Sumner. Brooks resented that as he resented Henry Wilson’s remarks on the caning and challenged Burlingame to a duel. Burlingame made a distinction between Brooks’ action, which he deplored, and Brooks himself. 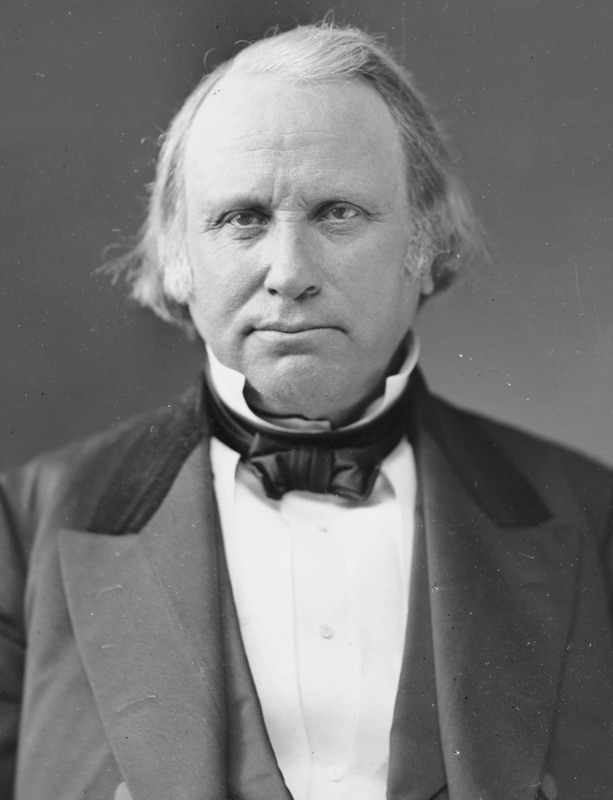 That satisfied Brooks’ seconds and Burlingame shortly left Washington to stump for the upcoming presidential race. I intended today to progress from that point, but a kind friend has put in my hands perhaps the only article ever written about the Brooks-Burlingame affair. It hails from The Ohio Archaeological and Historical Quarterly XXXIV, hot of the presses in 1925. Therein, James E. Campbell relates that Preston Brooks practically went shopping for dueling partners. He began with Henry Wilson, as we know. Campbell adds that Brooks issued a challenge to a Congressman Woodruff, who answered much in the same vein that Wilson did. Brooks resented Lewis Campbell for introducing the motion to investigate the caning and then chairing the committee which recommended Brooks’ expulsion. (Historian Campbell, incidentally, is Congressman Campbell’s nephew.) The day after the caning, friends advised the elder Campbell that he would soon face a challenge. Mr. Campbell made no reply until they passed a shooting gallery; when, turning back, he invited his friend to enter. Asking the proprietor to remove the customary target and replace it with a lighted candle, he proceeded to snuff that candle with a rifle ball, “off-hand” three times in succession. It is hardly necessary to add that the subject of his challenge was never afterward alluded to, for the certainty of death has a tendency to cool the ardor of the most persistent duelist. Inasmuch as attempts, not altogether unsuccessful, have been made to pervert its true meaning, I now withdraw it; and, that there may not be any misapprehension in the future I say, explicitly, that I leave my speech to interpret itself, and hold myself responsible for it without qualifications or amendment. On the 22nd day of May, when the Senate and the House had clothed themselves in mourning for a brother fallen in the battle of life in the distant State of Missouri, the senator from Massachusetts sat in the silence of the Senate Chamber, engaged in the employments appertaining to his office, when a member from this House, who had taken an oath to sustain the Constitution, stole into the Senate, that place which had hitherto been held sacred against violence, and smote him as Cain smote his brother. The Senate chamber didn’t have quite the perfect innocence from violence that we would hope. Henry Foote once drew a pistol on an angry and advancing Thomas Hart Benton, after all. But to the best of my knowledge no one before Brooks took the final step of actually committing violence. Everything before 1856 stopped at threats, brandishing arms, or went outside. As Burlingame said all this, Lawrence Keitt sat there listening. As soon as the line about Cain came out, he spoke up. Mr. KEITT, (in his seat.) That is false. Mr. BURLINGAME. I will not bandy epithets with the gentleman. I am responsible for my own language. Doubtless he is responsible for his. Mr. BURLINGAME. I shall stand by mine. After that posturing, Burlingame reached the event itself. He gave a brief summary of what everyone already knew and then really tore in. He denounced the caning in the name of the Constitution, Massachusetts, humanity, civilization, and fair play. Brooks himself, “if he has a spark of that chivalry and gallantry attributed to him” should lament his attack. Burlingame went on to castigate Slidell, Douglas, and Toombs. It seems that they came on Banks and Ashmun in Burlingame’s company. He “expressed his personal regard for Brooks” but persisted in attacking the caning. Distinguishing between the act and the actor opened up hope for a non-violent resolution. Everyone left the meeting convinced they had a modus vivendi. Burlingame left Washington to stump for the Republicans in the presidential race. Please help save the Affordable Care Act and Medicaid. We have got to keep fighting. Contact your Senators and Representatives through Resistbot via your smartphone or Facebook messenger. Call them through the Capitol Switchboard: (202) 224-3121, especially if you live in Alaska, Arizona, or Maine. I’m sorry Gentle Readers; we’re here again. If you followed the news, you might have believed that the Graham-Cassidy bill to destroy Medicaid and the Affordable Care Act, ripping health insurance and thus both access to health care and peace of mind from thirty-two million Americans was safely dead. On Friday John McCain announced his opposition to the bill. That gave it two declared no votes (the other from Senator Rand Paul) and two likely no votes (Maine’s Susan Collins and Alaska’s Lisa Murkowski). That should have sunk things, but Rand Paul has voted for prior ACA repeals/Medicaid destruction and has now signaled that he is open to doing so again as long as the cuts are deep enough. Graham-Cassidy didn’t have enough misery in it for him. Without Paul’s no, assuming Collins and Murkowski hold firm, the bill still dies. 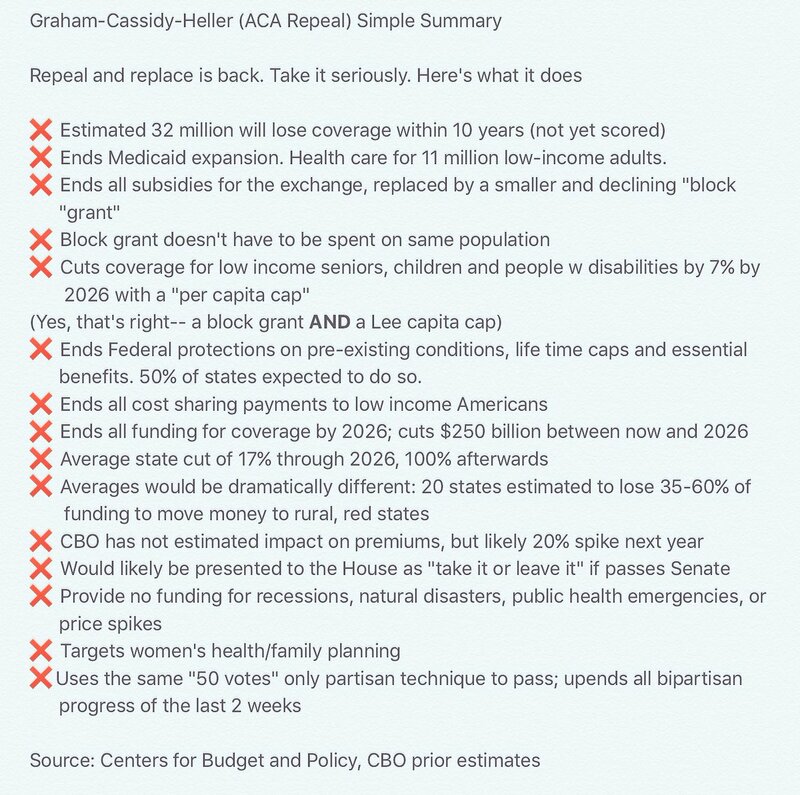 The drafters know that and believe they don’t have the votes, so a new version of Graham-Cassidy dropped tonight. You may have heard reports that it gives states more money, but analysts looking at the bill believe that the authors are using accounting tricks to hide that most states still lose badly. The new version guts protection for people with pre-existing conditions, rendering some of them uninsurable at any price and others unable to afford insurance. It still turns Medicaid into a block grant which expires entirely in 2026. It still authorizes states to let insurers sell policies that don’t cover essential health benefits, like prescription drugs or mental health care. Every protection you value in Obamacare is left up to the states to maintain or rescind in Graham-Cassidy 2.0. The only thing they added were partial payoffs for senators who they need to get to fifty votes plus Vice-President Pence’s tie-breaker. Although the state-by-state numbers being circulated show these states faring well, the Kaiser Family Foundation’s Larry Levitt called them “pretty misleading,” as they don’t take into account the per-person cap on federal Medicaid funding. They also add state savings to the block grants under the bill, but don’t include them in the current law baseline, meaning the comparison isn’t apples to apples. Allows “multiple risk pools,” which could separate sick and healthy people and thus drive up premiums for people with pre-existing conditions. Allows states to change the federal cap on out-of-pocket costs for enrollees. Allows states to decide how much insurers can charge people with pre-existing conditions, the benefits plans must offer and how cost-sharing is structured. States only have to describe their plans; they don’t have to submit waivers of insurance rules. “If there was any question about Graham-Cassidy’s removal of federal protections for pre-existing conditions, this new draft is quite clear,” Levitt tweeted. Meanwhile, holy crap…according to the GOP’s own estimates, California would lose $58.6 BILLION and New York would lose $27.5 BILLION. NEW: There have been developments tonight in Grassidy. They released new language. But apparently CBO only scoring old ones. I’m sorry to throw so much of Twitter into this post, and also the last, especially for those of you who already follow my feed and so have seen all this before. The content of the bill is itself profoundly disturbing, to say nothing of its effects. But I must rely on Twitter because at the time of writing the new language became available only a few hours ago. The Senate will likely vote to make it law or not on Wednesday. No official estimates of its costs or effects can be in at that time, not even the most basic and incomplete analysis from the Congressional Budget Office. The Senate Parliamentarian, who rules on whether a bill’s provisions are permissible under the special rules the GOP is using to avoid a filibuster, has no hope of parsing through it all honestly and fairly. It took days for independent analysts to get out estimates of the previous draft, which the entire American medical industry from patient groups to doctors to hospitals and insurers, all damned. This massive overhaul to an industry that constitutes a huge portion of the American economy, written in the dark of night and cynically sold to undecided Senators by promising them their states will not suffer as badly as other states. It was drafted in secret and will be voted on with at most two minutes’ debate in the United States Senate. The Senators have little hope of knowing what they are voting for or what it would do from the CBO, traditionally the most reliable, nonpartisan, and independent authority on a legislation’s costs and effects. The version of Graham-Cassidy which will receive a very partial, tentative score tomorrow that tells us almost nothing about it is the one from last week, not this one. There will be a sham hearing this afternoon. This is not how a democracy legislates. It may be true on some deeply cynical level that it helps the party I prefer if this thing passes and outrage at the Republican party results in Democratic victories at the polls, but it’s not worth it in lives spent or damage done to our freedom. Legislative process is often arcane and of much aid to those who want nothing accomplished. It badly needs reform. This is not reform. This is highway robbery that might as well have been cooked up in the F Street Mess. If a massively important bill, which is profoundly unpopular in every poll taken for any version of it, can pass this way then we live in a nation where our leaders don’t expect to have to contest fair elections again. I cannot in good conscience vote for the Graham-Cassidy proposal. I believe we could do better working together, Republicans and Democrats, and have not yet really tried. Nor could I support it without knowing how much it will cost, how it will effect insurance premiums, and how many people will be helped or hurt by it. Without a full CBO score, which won’t be available by the end of the month, we won’t have reliable answers to any of those questions. I take no pleasure in announcing my opposition. Far from it. The bill’s authors are my dear friends, and I think the world of them. I know they are acting consistently with their beliefs and sense of what is best for the country. So am I. Let me be honest with you, Gentle Readers. I do not, as a person of liberal beliefs, think highly of John McCain on a routine basis. His public statements, positions, and votes often anger me deeply. I’m sure that if he knew of mine, he would feel the same. He suffered terribly in Vietnam, where he went on our behalf. Now he suffers from cancer. I would wish neither on him or anyone else, even for an instant. I hope he has a speedy and full recovery. I also hope that if you dismiss me as a far left crazy who should get back to his history, you don’t dismiss him because we agree on this process being a shame. This is how dictatorships work, with backroom deals cut in defiance of the will of the people and contempt for democratic norms. It should not be how any nation operates, let alone one that declares itself a beacon of freedom. If you aren’t willing to fight for health care; fight for that. This is a traumatic time for everyone and go-around makes it a little bit worse, but we can’t give up. We have celebrated prematurely too many times, which helped get us here. We can’t stop before the other side, the side that wants to radically transform America, gives up. If we do that, they win and we let it happen. It’s time for Civics 101 all over again: go tell your congressional delegation to vote no. If they have announced opposition, even if they are leaders in the fight against Graham-Cassidy, get in touch to thank and encourage them. We have stopped these bills before through massive public pressure. We can do it again. It just takes enough of us standing up and saying this isn’t right, loudly and often. Lastly, this week I realized something. You may recall that I greatly admire the writing and ideas of Ta-Nehisi Coates. He makes the point that victory in a struggle for justice is good, but the struggle has value in itself. I don’t think that I, a white man, understood just what he meant until now. We can win this, but we might not. We have a choice before us either way, though. We can stand silent and let bad things happen, at which point we must call ourselves by our right name: accomplice. Every day we stand up and push back, we make it that much harder for the people who want to do great harm and see injustice thrive to keep on as they would. They want us despairing, convinced of the futility of opposition. This is a bad fight where the odds might be against us. Perhaps we should not dare to hope. We may do better for each other if we assume failure and fight anyway than by succumbing to overconfidence. But we are not alone and we are not powerless. The moral arc of history doesn’t bend on its own, but we can damned well knock a curve toward justice into it. We can do more. We can be a better, more just, more decent nation than we have been. We can hold to the values we claim. We can still be a free people who hope for greatness. No one person is going to change the course of history. Enough of us all pushing can. And have. Light the phone lines ((202) 224-3121) on fire. Send those ResistBot faxes -they’re still free- every day. Lives and freedom are both at stake. We cannot take anything for granted. This may not be over until 2020 or 2024. We have just got to keep fighting. What we do now, we do for those who come after as much as for ourselves. And if you disagree with me, Resistbot and those phone numbers work for you too. Every free country, or country that hopes to be free, needs an active, engaged, vigilant citizenry. That goes for all of us and I hope we have become more all those things than we have long been in the course of this. There is value in that struggle. We are all worth fighting for, from the people in Puerto Rico looking at months without electricity and with no relief in sight who should be the sole focus of our attention right now to undecided senators and people with sick children. This is how we can do it. Thank you for listening again. Once more, there will be history tomorrow. He is my friend; for many and many a year I have looked to him for guidance and light, and I never looked in vain.He never had a personal enemy in his life; his character is as pure as the snow that falls on his native hills; his heart overflows with kindness for every being having the upright form of man; he is a ripe scholar, a chivalric gentleman, and a warm-hearted, true friend. Burlingame may have meant every word of that; Sumner had the scholarly credentials, at least. Those who knew the Senator from his Massachusetts days had once found him quiet amiable. On his entry into politics, that changed. Sumner could likely have come up as an establishment Whig with little trouble, but the more he involved himself in reform causes the more difficulty he and his old friends had getting along. David Donald, Sumner’s biographer, believes he suffered some kind of mental break resulting from the strain on his business and career after he returned from Europe. Donald doesn’t think highly of Sumner in general, always hunting for the most venal explanations for his behavior, but he clearly has a point here. The future Senator probably clawed his way out of his travail by recommitting himself to causes that had already interested him. Doing so left him less inclined to shrug off differences and Sumner spent the later 1840s steadily losing friends. We left Preston Brooks leaving the House of Representatives. 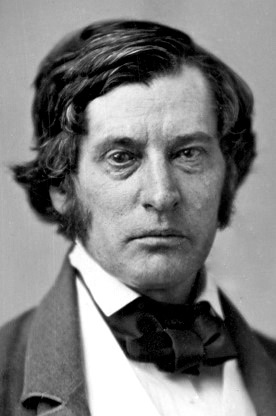 The chamber’s majority voted to expel him for breaking his cane over Charles Sumner’s head and continuing on with the broken stump until wrestled away. The Constitution required two-thirds to actually kick him to the curb, which the House could not muster on the grounds that most of the Southern caucus thought Brooks had done no wrong. In getting to that point, I overlooked an important episode. For the moment, let’s turn the clock back to June 21, 1856. Brooks and Lawrence Keitt still have their seats in the House of Representatives. The House committee have released their report and debate on it comes into full swing. with modesty, but with firmness, I cast down her glove to the whole band of her assailants. In the language of romantic chivalry, one strikes a foe with a glove and drop it to challenge them. Burlingame probably didn’t mean to issue an actual challenge; politicians of the era often use this kind of language for rhetorical effect. It shows them as men of learning and refinement, just as gratuitous Latin quotes and endless references to Antiquity did. He pressed on to vent himself against the Bay State’s censurers, from Franklin Pierce on down. To say that we were delighted with the speech we heard, would but faintly express the deep emotions of our hearts awakened by it. I need not speak of the classic purity of its language, nor of the nobility of its sentiments. It was heard by many; it has been read by millions. There has been no such speech made in the Senate since the days when those Titans of American eloquence -the Websters and the Haynes- contended with each other for mastery. He liked it. Sumner’s oratory reads as ponderous and repetitious to us, but the man could put on a show in person and some of what we would consider faults came off much better in the nineteenth century. Sumner acted out his speeches with practiced gestures and intonation, from memory, in an era when most men just read theirs. That can’t help but liven things up. It was severe, because it was launched against tyranny. It was severe as Chatham was severe when he defended the feeble colonies against the giant oppression of the mother country. Henry Wilson had a rough few days of it. He reject Brooks’ challenge to a duel, going out of his way to denigrate the whole practice. Friends advised against that, but Wilson bulled on ahead. Though Brooks never came after him, for some time thereafter. Wilson learned years later of possibly serious talk about roughing him up put down by James Orr. That all fell out over the last days of May. At the start of June, 1856, the House received the reports from the committee they had looking into the matter. Those recommended expulsion for Brooks and censure of Henry Edmundson and Lawrence Keitt, effectively demanding their resignations but stopping short of forcing the two out. The House didn’t take a vote on the recommendations until the middle of July, at which point a predictably hostile debate broke out. The South Carolinians made it a point of principle to defend their own. The Republicans naturally fought back. In the end, the House voted on sectional lines to expel Brooks. That didn’t give them the two-thirds majority they needed to do the job. Brooks opted to do it for them. According to Sumner’s Works, he gained the floor “with some difficulty” and gave an account of himself I’ve quoted liberally from. And now, Mr. Speaker, I announce to you, and to this House, that I am no longer a member of the Thirty-Fourth Congress. The next day, July 15, the House moved on to the punishments recommended for Edmundson and Keitt. Edmundson got off, 60-136. Keitt got censured 106-96. He likewise resigned. Both Keitt and Brooks submitted themselves to their constituents to fill the vacancies their resignations created. Both found themselves back in the House in early August, an absence of a little over two weeks. Preston Brooks could have challenged Charles Sumner to a duel. The Yankee would have refused and his fellow Northerners would have dismissed Brooks as a barbarian, but Brooks had the option. Doing so would have meant according Sumner a kind of peer status as a fellow gentleman, which didn’t have the visceral punch that Brooks wanted. He had to degrade Sumner by treating him like less than a white man to achieve satisfaction. Wilson damned Brooks on the floor of the Senate on May 27 and the speech roused Andrew Butler, just returned to Washington. He shouted that Wilson was a liar and other senators convinced him to withdraw the remark. Brooks didn’t take the news of it well and chose to get satisfaction again. This time, he challenged Wilson to a duel. He picked a proper second, Oregon’s delegate Joseph Lane. Lane later ran second fiddle to John C. Breckenridge on the Southern Democracy’s ticket in 1860. I characterized, on the floor of the Senate, the assault upon my colleague as ‘brutal, murderous, and cowardly.’ I thought so then. I think so now. I have no qualification whatever to make in regard to those words. I have never entertained, in the Senate or elsewhere, the idea of personal responsibility in the sense of a duellist. I have always regarded duelling as the lingering relic of a barbarous civilization, which the law of the country has branded a crime. While, therefore, I religiously believe in the right of self-defence in its broadest sense, the law of my country and the matured convictions of my whole life alike forbid me to meet you for the purpose indicated by your letter. In other words, Wilson knew what Brooks resented. He would not withdraw a word of it and he would not take part in Brooks’ affair of honor. People in Massachusetts didn’t go for that kind of savagery. Still, Wilson knew his protocols or at least had the good sense not to deliver his answer to Brooks in person; he had a congressman deliver it. Wilson’s history also tells that “a few Southern members” got together at a Washington hotel and debated doing something to him. 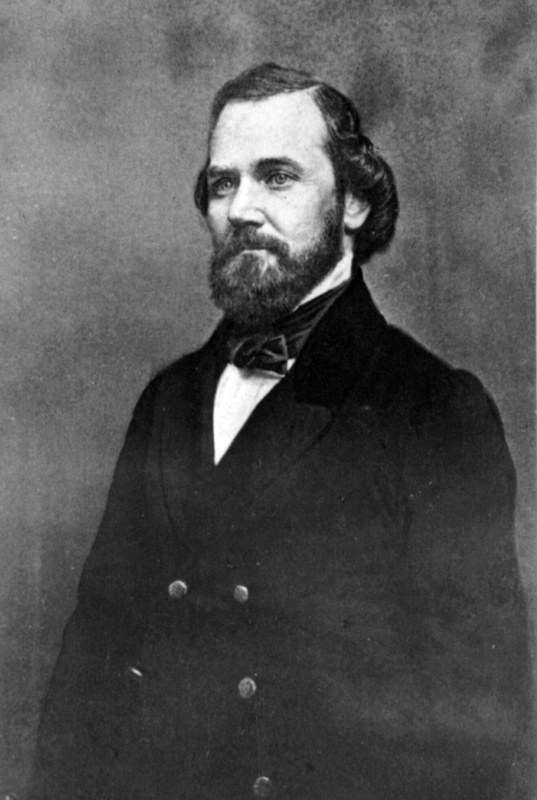 James Orr, one of the men who knew in advance of Brooks’ plan against Sumner, told Wilson in 1878 that he talked them down. I haven’t read this from anyone else and we must suspect that Wilson may have dramatized things. Orr could also have inflated idle talk into a serious conspiracy. Still, the toxic environment in Washington at the time, where Southerners endorsed Brooks wholeheartedly renders something on those lines happening plausible. Please help save the Affordable Care Act and Medicaid. Your calls, faxes, and emails can save lives. This is not a history post, Gentle Readers; please will bear with me anyway. I am grateful for every one of you, whether you stop by once or check every day. Knowing that you are there; that there are people who value what I write here enough to give the time to read it has helped me in ways too numerous to count. I would not have done the research without the readers, so you have benefited me tremendously. I understand the past and present so much more deeply now than I did a few years ago. The skills I’ve learned here have served me in other communities, most notably Reddit’s AskHistorians, where I have met new friends dear to me. The ability to come here five days a week and do something that I know others value, and contribute in a small way to the internet’s largest history enthusiast community, are deeply precious to me. All this together has done much to improve my mental health. It all started here, because some friends encouraged me to do this thing. I’m not in touch with all of you anymore but if you’re reading this; you know who you are. Please understand how much of a difference you’ve made in my life. WATCH: Not sure what Graham-Cassidy bill is? @ASlavitt explains. This is a bill to end Obamacare, but it’s also one to destroy Medicaid. It takes us back not just to before 2010, but all the way back to before 1965. The sponsors will argue that it doesn’t, but by replacing a federal entitlement for anyone in need with block grants they have ensured it. Block grants are just piles of cash which states can use for anything. They shrink as the years go on and were built originally to strangle programs that politicians didn’t like but couldn’t get enough support to destroy outright. The American people often forgive tremendous malfeasance, but we do have our limits. The block grants end entirely in 2026, at which point Medicaid either ceases completely or the cost is borne entirely by the states. As states usually have balanced budget constitutional amendments and it’s very difficult to raise revenue, that means at minimum and long before the ten years run out they will have to drastically cut eligibility, benefits, or both to the people who need them most desperately. That includes people on life-sustaining care and people who only have a livable quality of life because they can get help. If this law passes, people will die because of it. Before Obamacare, tens of thousands died every year because they couldn’t afford health care. After it, they will again. It’s not a perfect law, just the best we could do in 2010. People are alive today who would have died but for it. The same goes for Medicaid. NEW: Want to see how Graham-Cassidy ACA repeal transfers money around & impacts your state by 2026? If you’d rather read it in text form, then here’s an explainer. The bill will probably 32 million people without insurance, which combined with the present uninsured would leave us worse off than we were before Obamacare. The ban on refusing coverage or charging more for pre-existing conditions would be among the legislative casualties. Lifetime limits would be back. Insurers could sell you a junk plan and hike your rates the instant you got sick. Cassidy-Graham took everything Americans hated about health insurance in 2009 and opted to go for worse still. My state, Michigan, will lose $3,041 billion in federal health care money in 2026, and far more after. We are not the poorest state, but we can’t afford that. Few states could. When it comes time to choose who will suffer, the most vulnerable are always first on the list. The most vulnerable in the United States include plenty of white people -my mother and I both presently get our insurance through the ACA- but white Americans have done our best to ensure that the most vulnerable are disproportionately not people who look like us. I know that’s a terrible thing to say, but it’s true. Right now Arizona stands to lose a lot too, but since John McCain (R-AZ) cast the deciding vote last time you can bet they’re working on a way to make sure Arizona gets into the plus column. The last time, his governor told him that the state couldn’t afford it. This time we probably don’t have that luxury. Furthermore, McCain and Lindsey Graham (R-SC) are close friends. He’s the Graham in the bill’s name. I know this is the fifth time we’ve had to beg our members of Congress to let us keep having health care so we can keep living, keep having lives worth living instead mired in pain and worry. But it might be the last time. The special rules that the Senate presently uses to pass things by simple majority (50 Republicans plus the Vice President, in this case) expire September 30 and the GOP have made it clear they want the next turn with those for tax cuts. Wikler currently expects a vote late next week. It looks bad for all of us who care about our fellow citizens. According to polls, that’s an overwhelming majority of Americans. Even among Republican voters, none of the bills to date have been popular. The GOP knows that and has tried to sneak every one of them through without a thorough review and due consideration. We let that happen once before, but we stopped it twice over the Summer. This is still a democracy and the people still have power, as dark as things look. The greatest power we have now is our voices. The votes were lined up before and one fell out. One can again, but we need massive and unrelenting public pressure. We need to show up and be loud, reminding politicians that they work for us. Not everyone can make it to DC for a protest or visit a field office, but we all have phones and we all have the internet. It’s time to light the wires on fire for ourselves and, most importantly, for each other. Write letters to the editor calling our your congressmen and Senators by name and calling on them to fight. If they’re already a confirmed no, then thank them and make sure they stay that way. If they’re a yes, tell them to reconsider. Do it even if your Senator’s name is on the bill. You are literally their boss. You should get in touch with your governors too, especially if they’re Republicans and you have a GOP senator. You can do it on your own, or through the Capitol switchboard (202) 224-3121), or with the help of Resistbot. (The switchboard will not have your governor’s number, but Resistbot does.) Resistbot will give the right phone numbers via text or Facebook messenger. It will also allow you to send faxes, all completely free and easy to use. There’s no limit here; you can fax, or call every day. If something changes during the day, you can do it again. They’re not going to throw your message away because you rang twice. I have horrific phone anxiety so I use the faxes. The worst that’s ever happened to me was receiving a letter from my congressman. If you’re not sure what to say, then there are scripts you can use and there’s no shame in doing it. All that said, please only contact your congressmen, senators, and governors. They’re the people who work for you. It’s dishonest to pretend you’re local when you’re not and if staffers get the impression that most of the people who contact them are from out of district then they’ll ignore genuine messages along with the bad. Our democracy can’t afford that on any issue, now or in the future. Medicaid and the ACA are in the GOP’s firing line again with Graham-Cassidy. It’s the worst version yet. The law would destroy tens of thousands of lives. I’m sorry, but it’s so. You have got to take this deadly seriously. Assume they have the votes and be ready to obstruct to save those lives. I can’t tell you how difficult this is for me personally, and I don’t presently rely on either program for essential services. Imagine how people who will soon die without them feel. For them and all of us, you have got to pull out all the stops. Be loud on your social media. Toss out senatorial courtesy and withhold consent on everything until after September 30, when the reconciliation runs out. Be ready with amendments to filibuster during vote-a-rama. They have eight working days left. You can gum this up and force the GOP to move on. You are not powerless. You have got to stand up for the people of Michigan and every other state. We need you desperately. Please do everything it takes. This is something we can do for ourselves and, more importantly, for each other. Or it’s something we can not do and just let the bodies fall where they may; we have a history of that. But it’s not the only history we have and history is not destiny. We each make it in our ways small and large, through all the things we choose to accept or choose to fight. This is a time to fight. We can’t all be abolitionists or civil rights workers, but we can stand against the wrongs in our own time. There are people suffering now that we can help with the bipartisan bill being worked on Senate committee. There will be far more suffering and far fewer helped if Graham-Cassidy passes. I don’t want to ask you for anything but your time, but if you can do this then please do what you can. Calls, faxes, telling friends, everything can help. Spread these resources around; I don’t need credit and you don’t need to share my prose with them unless you want to. Let the people who represent you know that you can’t stand idly by and watch them consign your fellow human beings to untold misery, insecurity, and death. If this is presumptuous, if I have broken the social contract between us then I’m sorry. These are things I had to say. Thank you for listening. There’ll be history tomorrow.